WHAT goes on four legs, then two legs, then three? The Riddle of the Sphinx, from Greek mythology, denotes the eternal voyage of man… from crawling on all fours, to walking proudly erect, to finally ending up hunched over a cane. Pictures of Titanic passengers at the Sphinx in Giza – while on the Grand Tour – could offer another meaning. They sat on camels - four legs - then dismounted, two legs, and finally embarked a White Star liner’s maiden voyage. A journey of three legs: Cherbourg, Queenstown, and the broad Atlantic. – news article headline from April 1912 in a Brown family scrapbook. 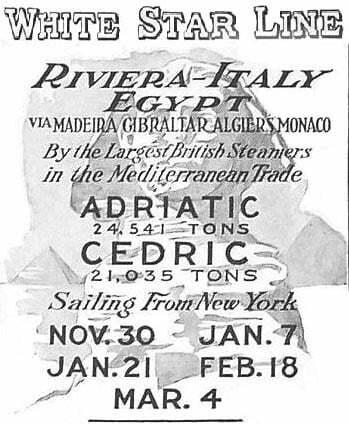 Mrs Brown was in Egypt with John Jacob Astor and his new bride, Madeleine, along with her own daughter, Helen, 23, who would stay behind in Europe – while Margaret packed Egyptian curios, intended for the Denver museum, into cargo crates bound for a liner’s hold. Her recently-acquired Egyptian talisman – a carving she would later give to Captain Arthur Rostron – she decided to carry on her person. She said she feared boarding the ship; she had evil forebodings that something might happen. We laughed at her premonitions, and shortly afterwards sought our quarters. The conventional understanding is that Mrs Brown was only casually acquainted with Mrs Bucknell, and in turn with Dr Arthur Jackson Brewe. 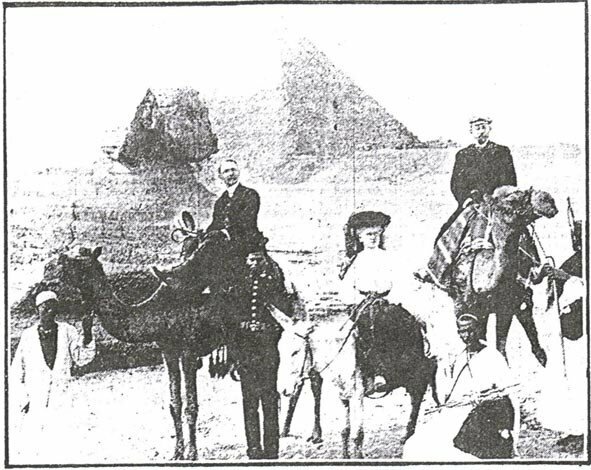 A photograph published here for the first time suggests that this may not be so – for all parties had been in Egypt together. 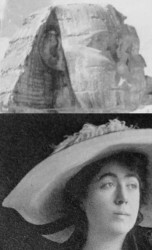 Margaret Brown and Dr Brewe are separately pictured at the Sphinx in March 1912. But it is the Brewe picture that is the more interesting of the two, and which throws up further puzzles. A photograph of Unsinkable Mrs Brown and her daughter Helen, both aboard camels, the ships of the desert, appears in a 1999 biography entitled Molly Brown: Unraveling the Myth, by Kristen Iversen. The picture, which takes up a full page in the insert section (after p. 102), is mysteriously inscribed across its face: “Ships that that pass in the night.” The word ‘that’ is repeated in error by whoever penned the legend. An effort to obtain the use of the image to illustrate this article (through Ms Muffet Brown) has regrettably proved unsuccessful. However an artistic interpretation of the photograph is copyright-free, and appears below. Right: White Star advertising for 1911/12 winter cruising, featuring the Sphinx. What is striking about this photograph is its compositional resemblance to another picture taken at the Sphinx, also involving at least one other Titanic passenger. It was published in the Irish Independent of May 22, 1912. The same camels appear in both photographs, the same white mule, and some of the same attendants. It could be that both photographs were taken within minutes of each other… but in the newspaper one, the caption relates exclusively to Irish-born passenger Dr Arthur Jackson Brewe. It will be remembered that Margaret Brown prominently mentions Brewe in her Newport Herald article. Were they all in Egypt together? Or were these pictures taken days apart? “Amongst the victims of the Titanic disaster, of whose last moments on the ill-fated vessel nothing is known, was a distinguished Galway man, Dr Arthur Jackson Brewe of the Netherlands, Forty-fourth and Chestnut Streets, Philadelphia. Dr Brewe was the eldest son of Mrs Butler, of Winterfield House, Drumgriffin, Co Galway, and a brother of Mrs Glynn, the wife of Dr Glynn of Waterview House, Turloughmore, Athenry. Born in Galway 45 years ago, he was educated in a preparatory school in Glencoe and subsequently at Clongowes, whence he matriculated to Trinity College, Dublin. Soon after taking his degree, he emigrated to the United States, first living in New York, and then moving to Philadelphia, where he made his home. He took a special course in Neurology in the Jefferson Medical College, and has been associated for many years in Philadelphia with Dr S. Mitchell in the treatment of nervous diseases. He was a member of the American Medical Association, of the Francis S. Derwin Neurology Society, and of the National Geographic Society. Dr Brewe, who had been on a tour of Africa, joined the Titanic from Cherbourg, having travelled through Rome, Naples, Florence, and Paris. His last letter was posted to his sister, Mrs Glynn, Waterview House, Turloughmore, immediately before he sailed, and she little thought as she read his graphic pen-pictures of his tour that he was fast approaching his doom. This letter was the last that was ever heard of Dr Brewe, with the exception of the laconic announcement that he was amongst those who had been lost with the Titanic. Isn’t this interesting! Margaret Brown prominently mentions a nervous Emma Bucknell, and in the same breath Dr Brewe - whom we now learn was associated with “the treatment of nervous diseases,” and travelling with a millionaire patient. It would appear the newspaper has made an erroneous assumption in presuming the millionaire patient to be a man, such that the woman on the equine is “his wife.” What if the ‘millionaire patient’ in this picture is instead Emma Bucknell herself? Here on ET a pen-picture of Mrs Bucknell has been supplied by Mike Poirier. Comparing the images would indicate that the photo which shows Titanic victim Arthur Brewe very probably also features Emma Bucknell (on white mule). The pictures are very similar, particularly in relation to the woman’s chin. 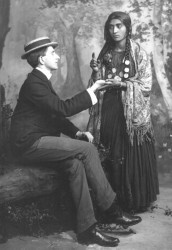 Bucknell in her 1912 US passport application declared herself to be aged 59, five feet three and a half inches in height, with a small nose and mouth, round face, fair complexion and grey hair. The presumption must be, therefore, that this is a previously unknown picture of the petite Emma Ward Bucknell in the month before she embarked the Titanic. 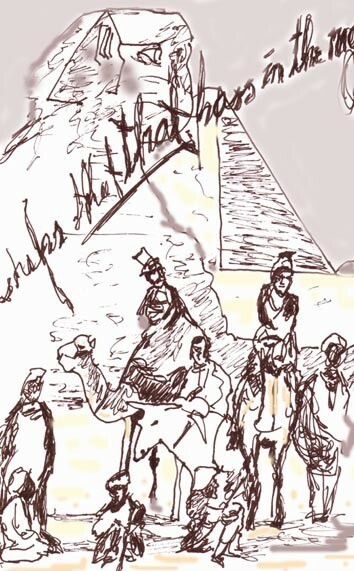 But Bucknell was travelling without her husband – which raises the question as to who the third person is, sitting on the camel to the left, under the chin of the Sphinx. Just because Mrs Bucknell was without a spouse while on the Grand Tour does not mean that she was unescorted. Dr Brewe, for one, was there. And among the few first class Philadelphians who boarded Titanic at Cherbourg, there was but one other individual – John Crothers Dulles. Dulles was a prominent Philadelphia lawyer, who had a summer home in Goshen, New York. No known picture exists of him. Therefore it may be time to invoke some spooks. Call in ‘the company’ among the camels… meaning the Central Intelligence Agency – the CIA. Yes, there is a Langley link to the Titanic, because John C. Dulles, a maiden voyage victim in 1912, was actually the first cousin of long-term CIA Director Allen Dulles. Allen Dulles’ father, John Welsh Dulles (b. Nov 1823), and John Crothers Dulles’ own father, Andrew Cheves Dulles (b. abt 1845), were brothers. When a picture of Allen Dulles is flipped and compared to the moustachioed man on the camel, there would appear to be a resemblance. If the theory is right, then these men would be first cousins, and a picture of John C. Dulles, Titanic victim, would be brought to light after nearly a century. A CIA conspiracy theory built on sand? It may be tempting fate too much to hope that a single newspaper picture was actually showing three Titanic passengers on camels and a steed! John Crothers Dulles was 37 to Brewe’s 45, both of them professionals from the same city. Dulles was an accomplished horseman, and the man to the left of picture certainly seems entirely at ease on his unusual mount. Dulles, like Brewe, was lost in the sinking. But Margaret Brown and Emma Bucknell, despite forecasts and forebodings, both came through unscathed. Meanwhile the little Egyptian puzzle remains, photographic hieroglyphics that may signify something... or less than we imagine. Photo taken from the Carmania a week before the disaster. This article started out with two Titanic legs, aimed for four, and may have established three. 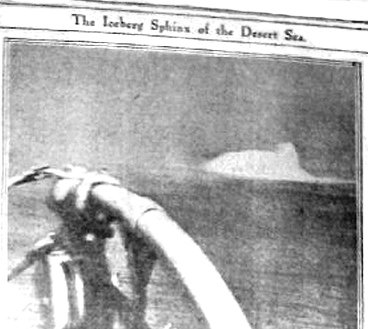 Never mind that the original sphinx of the famous riddle relates actually to a sea monster and not to Egypt at all - but then again, the twain may unexpectedly meet. It will do. Life is unknowable, and the sands of extinction must swirl in time over every endeavour. Ships and sphinxes all pass into night. Senan Molony’s new book “Titanic: Victims & Villains” (Tempus) is now available. This article, exclusive to ET, is not part of that work.